How do you put Open Science into practice? 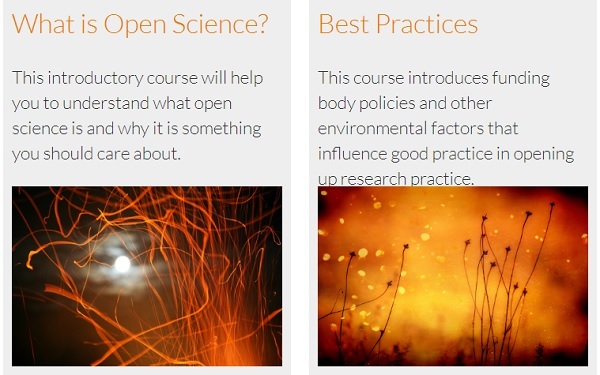 Take a look at these free Open Science courses that provide focused, practical and relevant, discipline-specific examples to answer some of the burning questions researchers have. The courses include practical tips on getting started with Open Science (OS) as well as providing information on discipline specific tools and resources you can use. There is no specified order through the courses – just explore topics that you want to learn more about at your own pace. These e-learning modules have been developed reusing openly available content produced by a range of content providers including DataOne, Research Data Netherlands, Open Data Institute, European Data Portal, Digital Curation Centre, UK Data Service, CESSDA, DARIAH, ELIXIR, Software Sustainability Institute, FOSTER and many others actively developing open educational resources relating to Open Science. These courses answer some of the most common questions you might have about putting OS into practice. Each course takes about 1-2 hours to work through and you’ll receive a badge upon completion. This introductory course will help you to understand what open science is and why it is something you should care about. This course introduces funding body policies and other environmental factors that influence good practice in opening up research practice. In this course, you'll focus on which data you can share and how you can go about doing this most effectively. This course introduces Open Source Software (OSS) and workflows as an emerging but critical component of Open Science. This course helps you to get to grips with responsible data sharing. This course will help you become skilled in Open Access publication in the wider context of Open Science. This course introduces the practice of sharing preprints and helps you to see how it can support your research. This course will introduce you to OPR and let you know how you can get started with it. This course will show you how Responsible Research and Innovation is accelerated through Open Science. This course helps you to find the best license for your open research outputs. Open Science Webinars Series 2018 form part of a broader training programme offered by OpenAIRE, IOSSG and the Italian Node of RDA. The Webinar series had a common format and was dedicated to the various actors who gravitate towards various capacities in the world of open science: researchers, librarians, research support staff, financiers. The goal was to provide clear information and practical tools to users on the topics covered, introducing the themes of Open Science. Materials and recordings are available here. EDX e-course: Open Science: Sharing Your Research with the World : Explore ways to apply Open Science principles to academic work - including your own. Learn how to share your research effectively and responsibly, building greater visibility and impact.